Want to play to-notch slots and other casino games? Guts obliges. Prefer dealing with a live opponent rather than a computer? Guts can offer top-notch live dealer games as well as a dedicated poker room. Fancy betting on the outcome of a football match, basketball, tennis, ice hockey, golf or one of 30 other sports? Guts will make it possible, and they’ve been doing so since 2013. 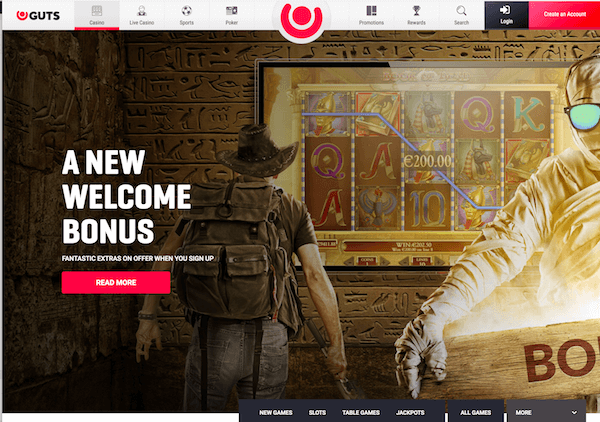 The brand is a member of a reputable family with highly-rated siblings such as Rizk Casino, Cashmio, InstaCasino and Dunder. Guts uses MT SecureTrade Limited platform and operates under their Maltese and UK licenses. Gaming portfolio was built with the help of Microgaming, NetEnt, NYX, Play ‘n GO, BetSoft, Yggdrasil, Quickspin, Leander, Pragmatic Play, Red Tiger Gaming, Saucify, Bally Wulff, NoLimit City, Evolution Gaming and a few others, thus making sure players can access the best casino games available these days. 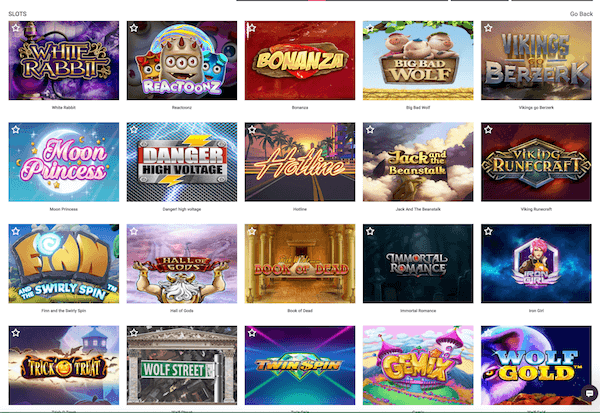 They won’t be asked to download and install casino software; all featured games are instantly accessible online and players can use Demo mode to test them risk-free. There are well over 1,500 to choose from so it’s convenient one can filter them by category, popularity or provider. Party starts with a 200% bonus worth up to £100, followed by 100 free spins credited daily for the next 5 days. One can qualify with a minimum deposit of £10 as long as funding isn’t done via Neteller, Skrill or PaySafeCard. Both bonus and deposit amounts have to be wagered 30 times prior to requesting a withdrawal, and you’ll have to do it within 15 days or else the gift and the resulting winnings will disappear. Most video slots contribute 100%, classic slots 75%, Live Roulette and Blackjack 10%, Live Baccarat and Casino Hold’ Em 5%, and table games and video pokers 0%. Simultaneously betting on Red and Black and similar risk-free wagers are prohibited. The maximum bet you can place with bonus active is £5. The good news is free spins come free of wagering requirements; you’ll have 24 hours to claim them and 72 hours to use them on a specified slot (currently Book Of Dead). With a library of this size, you can bet your entire balance on finding universally popular titles from each of the featured developers. That includes Big Bad Wolf, Immortal Romance, Blood Suckers, The Slotfather, Gemix, Jungle Books, The Rift, and more. Jackpots section is pretty packed with progressive slots featuring mouth-watering multi-million rewards, such as Mega Fortune, Hall Of Gods and Mega Moolah. Book Of Dead, Starburst, Jammin’ Jars and Wild Reels are four titles with a premier placement. NetEnt’s Starburst hardly needs an introduction, but let us remind you what the game is about in case you haven’t played it for a while. This is a win-both-ways video slot with expanding Wilds which will trigger a re-spin. If the re-spin delivers additional substitute icons, they will also stretch to cover the entire reel and launch yet another free spin – theoretically resulting in the complete game area covered in Wilds. Jammin’ Jars is a Push Gaming title playing on an 8×8 reel area. Cluster wins activate cascading action, and each collapse makes Wild jam jars move to a random vacant position while increasing their multiplier. This can prove to be exceptionally lucrative while spinning for free. Randomly-triggered Rainbow feature adds giant fruit symbols which convert covered positions into icons of the same type. Book Of Dead by Play ‘n GO has a win potential of 250,000 coins and features free spins with a special expanding symbol randomly chosen to help you win more. Wild Reels by GiG Games guarantees one or more reels will be fully Wild on each spin. Most of 75 live dealer games powered by Evolution Gaming and NetEnt are available 24/7. Attached betting limits make it possible for anyone to get a taste of what playing in a land-based casino feels like. At the same time, maximum bets are high enough to please high-rollers. The two developers have provided European, French and American Roulette, unique Lightning Roulette and several native variants, one of which allows UK players to talk to a croupier speaking British English. There are more than 40 Blackjack tables which will either seat up to 7 players and offer others to Bet Behind, or allow for an unlimited number of fans to play the same game simultaneously. Evolution Gaming features a unique offer of Baccarat tables playing the classic game at a normal place, its speedy and squeeze variant, No Commission Baccarat or Dragon Tiger. They have also supplied their entire collection of Live Poker games, namely Caribbean Stud, Three Card, Casino Hold ‘Em, Ultimate Texas Hold ‘Em and Texas Hold ‘Em Bonus Poker. Find the Casino via your mobile browser and you’ll be offered the same package consisting of RNG games, those playing live, sports to bet on, and an engaging poker experience available in a dedicated section. Game offering inevitably shrinks, but 800+ slots and close to 100 table games (including live ones) should be enough to keep you entertained even if you’re stranded in the middle of nowhere. A smartphone or a tablet and a decent internet connection is, obviously, a must. Don’t waste time searching for native apps as there are none. Players can register an account in GBP, EUR, NOK, SEK, USD, CAD or AUD and make deposits using Visa, MasterCard, Neteller, Skrill, ecoPayz, Sofort, Euteller or Zimpler. If their gaming session ends with a positive balance, they’ll be able to collect up to £20,000 per transaction, depending on the chosen payment method. Guts will process withdrawal requests in as little as 6 hours which means eWallet payments are nearly instantaneous. Guts performs well above average no matter which of the elements you look at. Gaming portfolio is huge, its quality ensured by including top developers, and variety achieved by partnering up with 15+ different ones. Players can claim various special offers pretty much whenever they show up, enjoy super-fast withdrawals, and will never have to wait when in need of support; skilled advisers are at their disposal night and day, providing fast and accurate answers and quick resolutions of any gaming-related issues. Credible regulatory bodies vouch for safety and fair play, just in case MT SecureTrade umbrella isn’t enough to put your mind at ease (which it should be).